When Germany launched its blitzkrieg invasion of France in 1940, it forever changed the way the world waged war. Although the Wehrmacht ultimately succumbed to superior Allied firepower in a two-front war, its stunning operational achievement left a lasting impression on military commanders throughout the world, even if their own operations were rarely executed as effectively. Robert Citino analyzes military campaigns from the second half of the twentieth century to further demonstrate the difficulty of achieving decisive results at the operational level. 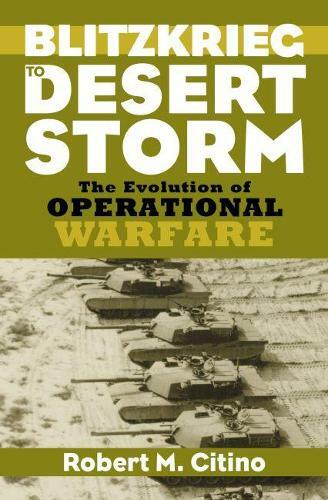 Offering detailed operational analyses of actual campaigns, Citino describes how UN forces in Korea enjoyed technological and air superiority but found the enemy unbeatable; provides analyses of Israeli operational victories in successive wars until the Arab states finally grasped the realities of operational-level warfare in 1973; and tells how the Vietnam debacle continued to shape U.S. doctrine in surprising ways, Looking beyond major-power conflicts, he also reveals the lessons of India's blitzkrieg-like drive into Pakistan in 1971 and of the senseless bloodletting of the Iran-Iraq War.